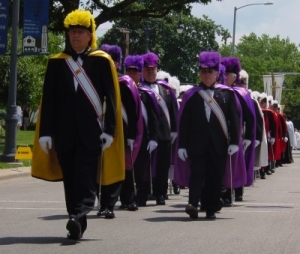 The Color Corps of the Knights of Columbus are the uniformed members of the Fourth Degree. They are the ones that are most noticeable at church and public functions, parades, etc. They actually consist of two parts: The Honor Guard & The Color Guard. Honor Guardsmen are those members who have mastered the Manual of the Sword. All others are Color Guard.The Corps basically follows a Naval theme with ranks and insignia. Note that the chapeaux, which are never called hats, are similar to the old naval uniforms. Cape colors are an indication of rank. Vice Supreme Masters wear blue capes and chapeaux with blue plume. Masters wear gold capes and chapeaux with gold plume. District Marshals (District level Color Corps Commanders) wear green capes and chapeaux with green plume. Faithful Navigators (whether a member of the corps or not) wear white capes and chapeaux with white plume. Color Corp Commanders wear purple capes and chapeaux with purple plume. All other Color Corps Members wear red capes and chapeaux with white plume. Within the local assemblies, the Master more or less sets the rules. In the Bishop Kaffer Assembly, the highest ranking Color Corps member is called Commander. Former Vice Supreme Masters, Former Masters, Former District Marshals, and Past Faithful Navigators are all permitted to wear their respective capes and chapeaux when they finish their term of office. If you are presently a member of the 4th Degree and would be interested in joining the Color Corps contact our Faithful Navigator, Bob Martin or Corps Senior Commander Kevin Fischer. If you are interested in becoming a Fourth Degree Knight, see your council representative for an application and full details. You may also phone or e-mail the Bishop Kaffer Assembly Faithful Navigator, Bob Martin or the Faithful Comptroller Mike Herbst.